As you know by your own experience, this can be a very time-consuming trick. League Planner not only saves you a lot of time and effort to prepare a tournament, but also during your tournament it is a friend you don't want to miss. Every tournament organizer knows how hard it is to have a stack of entry forms, draws and more, and sort it all out to have a great tournament. League Planner supports many types of tournaments. You can have as many knock-out draws and round-robins per event as you like. Also consolations and playoffs are supported. League Planner is the most user-friendly software you will find. Use one mouse-click to plan a match, print a draw, show different events and more. You can always use the built-in help function, but al your available functionalities are always visible on the screen, so you won't need to read a 'bible-size' manual. All player data visible at once. Round Robin standings are calculated realtime after entering results. You can define your own calculation rules. Publish your league on the internet. 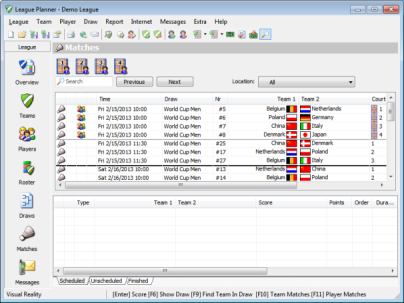 All your draws and matches can easily be published on the web!